The Mantel: A Timeless Tip To Decorate It! I know many people struggle with decorating their mantel. My advice? Keep that mantel simple (except during the holidays, when you can do it UP). 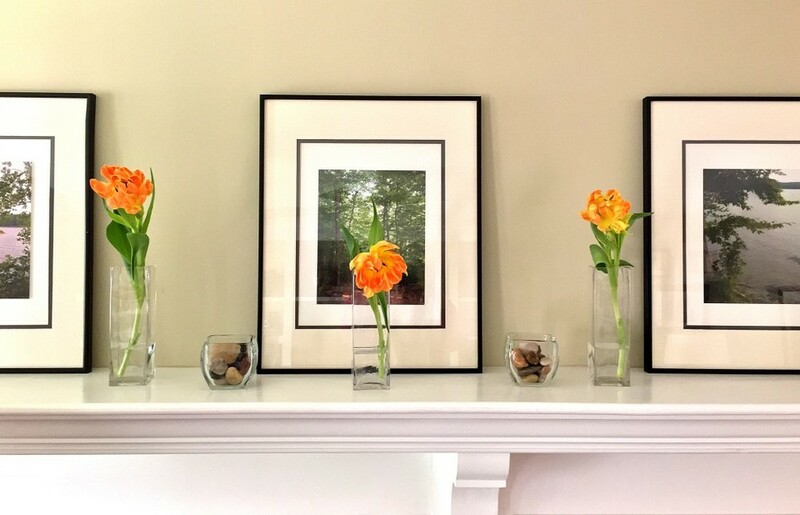 This timeless tip requires 3 key items; single stems of seasonal flowers, bud vases and framed photos. "Timeless" means you don't have to change it out often, which is a huge plus in my book. Change the flowers when they fade and go on with your day! Last week's flowers were tulips. When I buy flowers, I always get a couple extra to use on the mantel. The short glass bowls had candles in them yesterday (Easter), so today I put polished river rocks in them, but they'll get put away soon. The tulips and framed photos are enough. Keep It Simple! This week I stumbled upon these faux tulips. Faux makes it even easier! Would you like to hear how you could update other spaces in your house--easily and affordably? Call DeCocco Design to schedule a 2 hour design consultation. I'll give you ideas, make recommendations and tell you where to shop and who to call to get it all done. I'm certainly consistent! The framed photographs haven't been put back up yet, but they will be soon enough. Someone else liked this spot, and put that sunshine to good use! I hope you notice and enjoy the sunny spots in your home.